Imagine yourself standing in a remote corner of northern Australia. Before you stretches an expanse of rolling hills, extending as far as the eye can see. The hills are covered with a carpet of green. You step forward, eager to explore these open fields. But as you approach them, everything changes. What appeared to be a uniform carpet is actually dense tussocks, each separated by an underlay of bare gravel. And instead of soft, yielding blades, the tussocks offer you nothing but resin and hate. Welcome to spinifex country. Grassland dominated by Triodia pungens (bright green) and T. basedowii (grey-green), copyright Hesperian. The spinifexes of the genus Triodia are a uniquely Australian group of plants. Some North American grasses have been assigned to this genus in the past but have since been moved elsewhere. There is also a widespread genus of coastal grasses that formally goes by the name of Spinifex but that is something different again. In many parts of arid Australia (and arid Australia equals most of Australia), spinifexes are the dominant form of plant life. As noted above, they grow in tight tussocks that may reach remarkable sizes and densities: clumps of the largest species may reach 2.5 metres in height and six metres in diameter (Lazarides 1997). Not uncommonly, these largest patches will be ring-shaped due to the centre dying off while growth continues around the edges. The leaf blades are long, needle-shaped, woody and rigid. Speaking from experience, the sharp tips of these blades will break off all too easily, embedding themselves in the flesh of any passers by. And some idea of their rigidity will also be conveyed by the fact that, in the growth season, it was not uncommon to discover macabre shish kebabs made from jumping grasshoppers that had had the misfortune to land on the end of one. Mature stand of Triodia irritans, showing the tendency of hummocks to grow into circles as the centre dies off. Copyright ANBG photo M. Fagg. Nearly 70 species are currently recognised within the genus, often differing in their preferred microhabitat. One of the most common species, Triodia basedowii, extends its range across almost the entirety of the continent between 18 and 30 degrees South and west of the Great Dividing Range. This species has a preference for sandplains and dunefields. Other species are far more localised. 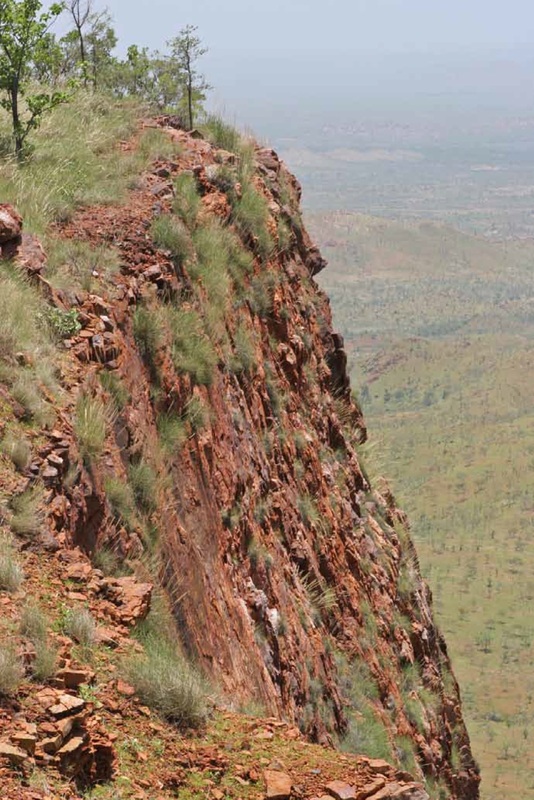 Barrett & Barrett (2011) described two new species found in association with sandstone cliff faces in the Ragged Range in Western Australia. Triodia barbata was found only in a thin band along the top of the cliff faces and may have had a population of only about 300 individuals. The more abundant (but still not widespread) T. cremnophila was found only on the vertical faces of the cliffs themselves. However, it must be noted that large gaps may exist in our knowledge of the ranges of Triodia species because of the remoteness and difficulty of getting to many of the regions in which they are found (seriously, if you've never been to central Australia yourself, it is difficult to appreciate just how much Absolutely Nothing there is there). Triodia mollis is known from two widely separated regions in northern Western Australia and Queensland with no confirmed records as yet from the entire expanse of the Northern Territory in between. 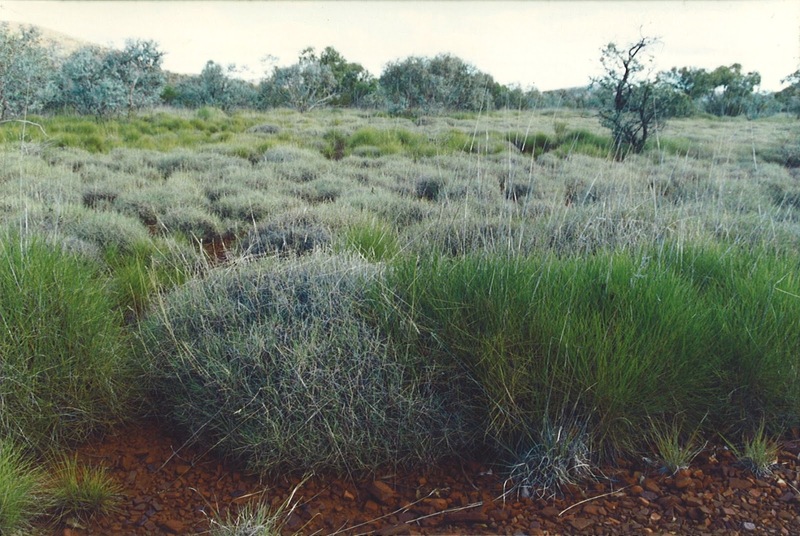 Preferred habitat of Triodia cremnophila, from Barrett & Barrett (2011). Yes, it only grows on the cliff face. Yes, someone presumably went down the cliff face to get specimens. Being as woody and harsh as it is, it should come as no surprise that relatively few animals are capable of eating spinifex. Many Australian termites, such as the endemic genus Drepanotermes, are spinifex specialists; workers of Drepanotermes may be seen leaving their nest at night to collect pieces of spinifex blades and carry them back. Pastoralists may refer to 'hard' and 'soft' spinifex varieties but the difference is one of degree only; even the 'soft' spinifexes (usually the resin-producing species) are pretty damn hard by the standards of any other grass. Livestock are sometimes grazed on spinifex when bettter options are unavailable, in which case patches of spinifex may be burnt off to encourage the production of younger, more palatable growth (spinifex burns exceedingly well but also grows back readily from the remnant rootstock). The resin from spinifex also has a history of being used by indigenous Australians as an adhesive when making tools. For the most part, though, the main value of spinifex remains in its role as the dominant vegetation and habitat for the areas where it is found. Barrett, R. L., & M. D. Barrett. 2011. Two new species of Triodia (Poaceae: Triodieae) from the Kimberley region of Western Australia. Telopea 13 (1–2): 57–67. Lazarides, M. 1997. A revision of Triodia including Plectrachne (Poaceae, Eragrostideae, Triodiinae). Australian Systematic Botany 10: 381–489. Wow!! fascinating plants but maybe I should be glad they don't grow here (USA). Offering nothing but resin and hate... quite funny!